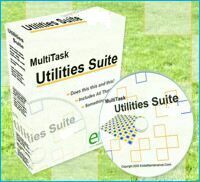 The MultiTask Utilities CD may be either downloaded as an ISO file which you can then burn to a CD, or the CD can also be sent to you FIRST CLASS mail for an additional fee. After paying you will automatically sent to a Download Page that contains the URL for the file you need to burn the CD and the special GUI fdisk/fomat utility. Please note that you can use Paypal without setting up an account. If you dont like Paypal, then click here.